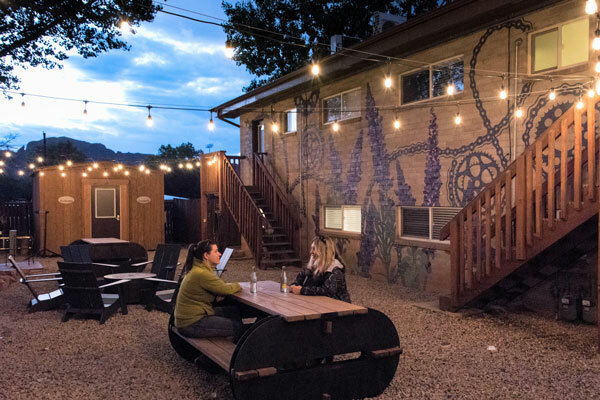 The outdoor space is one of the most popular aspects of Purple Sage Flats. It is a fantastic place to relax after a day of adventure, have a meal or work on your gear. On the grounds there is a shaded sitting area with café lights. There is a hot-tub that holds eight. There is a gathering area that has a fire-pit on cooler evenings. You can grill on the BBQ and eat a meal at the picnic tables under café lights. The grounds are a retreat from the desert with big shade trees, fire-pit, large hot tub, picnic tables and barbecue grill on the patio. There is a secure bike barn and bike stand. There is a great place to hang out and work on bikes and a large bike lock building to keep your bike secure during your stay. There are also on premise laundry for guest.